The 2018 Cupar Flower Show took place on Saturday 11th August, in the Corn Exchange, Cupar from 10am. Judging of the Garden Competitions took place on Saturday 21st July 2018. The public of Cupar and the surrounding area came out in force on Saturday to support the Cupar Flower & Craft Show held in the Corn Exchange and were presented with the most colourful and attractive display of cut flowers the show has had for a number of years. The wonderful scents of lilies and sweet peas welcomed all attending the 106th annual Show, coupled with the very colourful table of pot plant exhibits. Tom Nelson from Cuparmuir was the winner of the East of Scotland Four Vase Sweet Pea Championship, with Andrew Banks of Musselburgh taking the John Gerrie Medal for the most first prizes in pot plants for the second year running. There was a fantastic display in the vegetable section, with the extraordinary specimens of the tallest leeks, celery, carrots and cauliflowers being shown by Mr Ted Low of Strathkinness, who also gained the most prizes in the vegetable section. This year’s schedule had an emphasis on a gold theme. This was supporting the Glow Gold (September) campaign for childhood cancer awareness, and Cupar born youngster, Toby Etheridge, who, with his family run the charity Toby’s Magical Journey, presented all the trophies to the award winners at the end of the day. The floral art category saw an amazing display of exhibits. Our judge had a tough job of selecting the winners due to the quality of the exhibits being shown. The best floral exhibit in show, sponsored by Gladys Lundie, was awarded to Jenny Fusaro for her “Glow for Gold for Toby” exhibit but the overall winner of the section was Mrs Ann Duff from Balmullo. The industrial section was supported well with a range of home baking, preserves and handicraft section. Mrs Vera Drysdale, Cuparmuir championed the section and took home the Watt Trophy for the most prizes in Show. Schools in the local area were able to get assistance from SRUC Elmwood Campus to help them “Grow for Gold” which could take the form of a flower garden, vegetable garden or a combination of both, encompassing the colour gold, to signify support of childhood cancer awareness. Judged at the end of June before the school holidays, saw only five entrants, from primary and secondary schools to nurseries taking part in ‘Grow for Gold – best garden allotment’. Dairsie Primary School came out on top with judge, Bruce Robertson from SRUC, commenting that “It would be great to see more schools and pre-school groups get involved in this competition as it is an ideal opportunity to introduce children to horticulture, one of the country’s most popular pastimes. This year’s competition whilst lacking numbers made up for this by way of quality and enthusiasm! The competition was stiff; all of the schools and especially the pupils involved are to be congratulated on their efforts and their enthusiasm in explaining their ideas to me. As in any competition there are always winners and whilst Dairsie was judged the overall winner, I consider all who took part to be winners”. This competition is supported by SRUC Elmwood Campus and the students from the Horticultural Unit are happy to assist in any way in developing the gardens or providing some surplus plants to help get the gardens established. If you’d like any help or advice for the School garden, please get in touch with the Cupar Flower Show organisers. The Scottish Women’s Institute Competition based on ‘A Baby’s Christening’ was won by Cameron SWI. Along with trying to encourage the younger generation, or those new to growing and exhibiting, the Society put on a Novice Section for those new to the showing scene. This section saw an increase in numbers, and covers not only flowers and vegetables, but baking and other novelty classes too. This year’s trophy winner was Gordon Peebles. So why not have a go next year…exhibits certainly don’t have to be perfect…just look at Gordon’s wonky carrot! The generosity of the local businesses through sponsorship or the donation of prizes cannot be emphasised enough; it’s down to them that we are able to award the level of prizes we do and to put on such a fantastic show. There was also a fantastic backdrop to the lower hall from the Fife Bonsai Society, who were busy styling trees throughout the day. Vice President, Debbie Peebles thanked all the competitors, committee members and visitors who made the show a success and said “It was nice to see some new exhibitors coming away with awards and it’s encouraging that our new categories for novice growers and Bonsai’s were well supported. 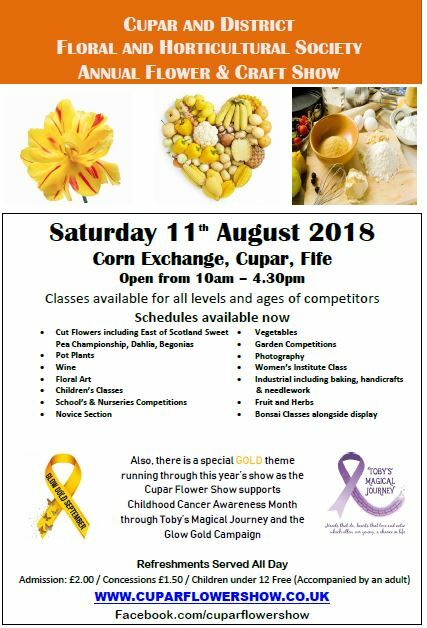 It was a pleasure for the Cupar Flower Show to tailor the show schedule to support the local charity of Toby’s Magical Journey and bring childhood cancer awareness to the fore. We (the committee) would like to thank each and every one of you who attended the event, either by way of the coffee morning, or by having a wander round the beautiful display of exhibits of the flower show”. Toby Etheridge said “Saturday was a great experience, to speak to many people either about my charity or plants, especially the Bonsai! It was an honour to present the trophies to the worthy winners as well as winning myself first prize in the under 16 photography class. I was also impressed with everyone taking part to support childhood cancer and Glow Gold. The committee work so hard and you can see the love and dedication that goes into making the show happen year after year. Toby’s Magical Journey would like to thank you all for supporting our charity and the Glow Gold September – childhood cancer awareness campaign. Every day 11 children will be diagnosed with cancer today. Three of those children won’t make it. With over 4000 children with cancer, lets raise the awareness – our children are our tomorrow”. So, if you enjoy gardening; create hanging baskets in spring, have a nice patio ornament, maybe have a collection of border flowers, grow your own fruit or vegetables, are good at baking, needlework or floral art, please give consideration to entering next year’s Flower Show – this really is an amateur’s show. We are also always looking for committee members and volunteers as numbers are always dwindling and the success of the show depends on you. Guess the weight of the cake, sponsored by Fisher & Donaldson was won by R Munro, Cupar and the hamper was won by Vera Drysdale. Many thanks to all who donated prizes and raffles.